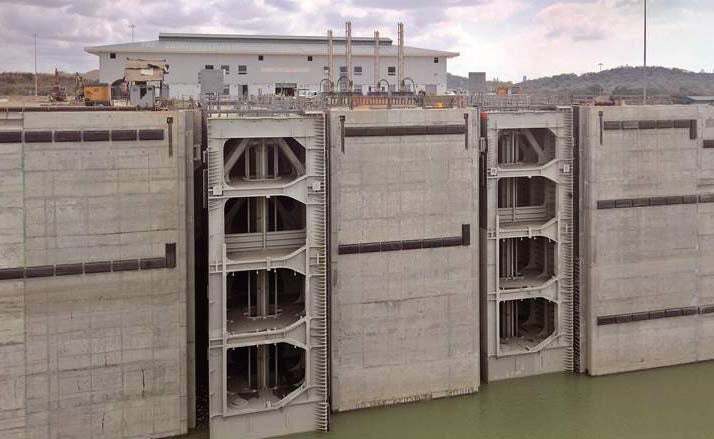 As more than half of the world’s vessels are currently too large to use the Panama Canal, the third set of locks expansion project is vital to its continued success. This is the third expansion project since the original plan to cut through the Isthmus of Panama was conceived in 1879, reducing the time sailing around Cape Horn by an order of around 40 times. The significance of this new design is that the lock gates are not conventional, in that they are moving laterally on rollers to close the lock, rather than swinging closed. Th e sheer weight of the rolling gates would cause the rollers to damage the lock bed, so they have been designed and made hollow, therefore semi-buoyant, reducing their effective weight by half. The other significant feature of the lock system is that to conserve water supply needed from Gatún Lake, the locks are designed to actually recycle water, by using holding basins for the three-stage decent/ascent. This saves over half the volume of water that would have been used in the conventional lock system – a saving of around 120 million litres of fresh water a vessel passage. Hydraulic drive units operate the locks’ valves that control the flow of water between the lock chambers and also between each lock chamber and the water-conserving basins – employing a total of 158 operational valve drive units for the Canal system. Th e manufacturer of the valve drive units selected PANOLIN HLP SYNTH biodegradable hydraulic fluid for the hydraulic power units for its proven long life and consistent high-performance and, due to its long life, an overall reduction in CO2 emissions, than if mineral based oil was used. Therefore since the opening of the Panama Canal 100 years ago, this major lock expansion is significantly contributing to the increased capacity of the canal, its operational performance/reliability and, the reduction of water usage and CO2 – assisted by the use of PANOLIN environmentally acceptable lubricant.